Ash Taylor is relishing the challenge of taking on promotion-chasing Bradford City at Sixfields on Saturday (ko 3pm). The central defender admits that fixtures don’t seem to be getting any easier for him and his Cobblers team-mates, but it is a challenge they are excited about. Town have already played five of the top eight in Sky Bet League One this season, including the current top three, and they now host fourth-placed Bantams on Saturday. “The games don’t get any easier but we’ll take it in our stride,” said Taylor, who has been an ever-present for the Cobblers this season, following his summer transfer from Aberdeen. “We know what we’re doing and we know what we’re about. “I’m sure the gaffer and the staff will have us well-drilled and focused on Saturday. “Bradford are a very good side but we’re looking forward to playing them. Town have a 100 per cent home record under new boss Jimmy Floyd Hasselbaink, winning two from two, but they go into this weekend’s game having failed to clinch victory either of their past two games. The Cobblers followed up last Saturday’s 2-2 draw at Southend United with a narrow 1-0 loss at in-form Wigan Athletic on Tuesday night, and although the match ended in defeat, Taylor believes it was still another step in the right direction for Town. 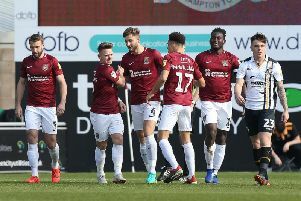 “We kept our shape well and it was a shot from distance that did for us in the end,” said Taylor, reflecting on the match at DW Stadium that was settled by a 30-yard strike from former Cobblers midfielder Michael Jacobs. “I think were in the game in large spells. We kept our shape really well and frustrated them. So what difference has Hasselbaink made in his short time in charge at Sixfields? “His (Hasselbaink) work ethic is brilliant and he makes sure no stone is unturned and that every single detail is right for the next game,” said Taylor. Town have gone from rock-bottom in the table to 17th in the past couple of weeks, but Taylor still wants more, and believes the team will continue to rise. “Teams will look us now and know that we’ve got a really good side. We’re starting to pick up results and look more of a formidable side now,” said the 27-year-old.